Today at the HTC Conference 2014 in Tokyo, Japan, HTC announced the much-rumoured HTC J butterfly smartphone for the Japanese market, marketed as the HTC Butterfly 2 in other South East Asian markets. The latest generation Butterfly 2 will be available in Taiwan from 2 September 2014. 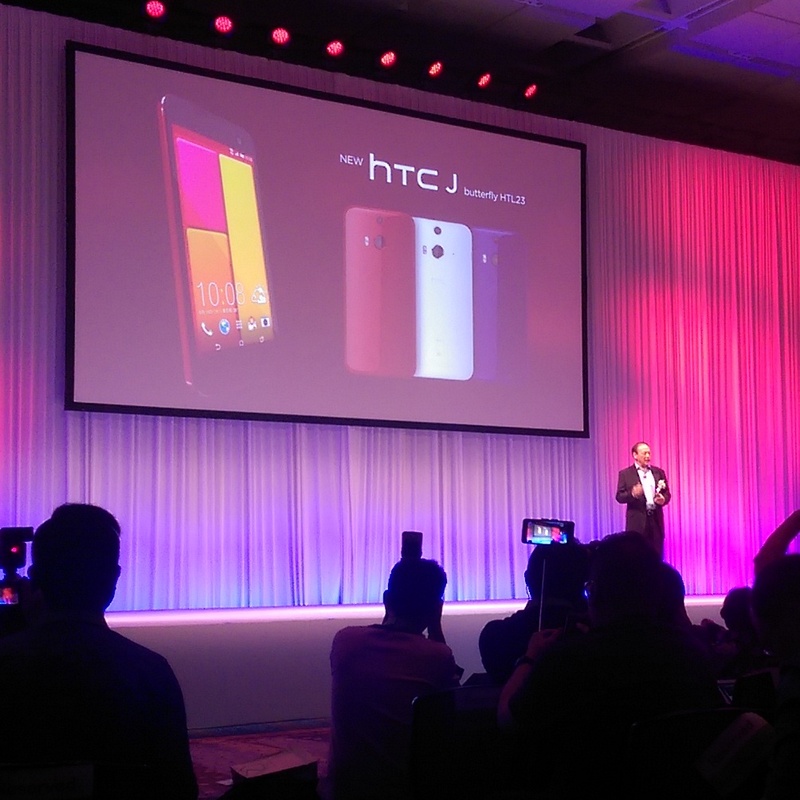 Chunghwa Telecom will be the exclusive telco for the HTC Butterfly 2 in Taiwan. It comes to no surprise that HTC chose to launch its new Asian-focused product in the two markets it has been a best-seller in. The new Butterfly 2 has a new egonomic curved form factor, integrating HTC’s innovative Duo Camera setup and 5-inch Full HD display. Dimensions-wise, the Butterfly 2 is similar to the HTC One M8, weighing in at a scant 151g. The new device comes with a special polycarbonate unibody which is dust- and water-resistant up to IP57 standard. It’s available in Rouge, Indigo and a matt anti-stain Canvas (white). The new Butterfly has FDD-LTE and TDD-LTE as well as WIMAX2+ support built-in, something unprecedented, thanks to AU technology from KDDI in Japan. HTC’s much-touted Duo Camera is paired with a new non-UltraPixel 13MP camera module. Additionally, a 5MP front-facing wide angled camera should keep selfie-taking consumers happy. A powerful quad-core 2.5Ghz Qualcomm Snapdragon chipset powers the device along with 2GB RAM and 16/32GB storage expandable via microSD. HTC places a huge emphasis on audio quality, and this can be observed in the HTC Butterfly 2 – integrating BoomSound which supports 24bit/192Khz lossless audio, coupled with dual front-facing speakers. The Butterfly 2 runs HTC Sense atop Android 4.4.2 KitKat, and delivers “the best, fastest Android user experience” coupled with innovative features like Zoe, HTC Blinkfeed and Motion Launch. A surprising addition is the support for HTC Dot View case, which first debuted with the HTC One M8. The Dot View case is available in a variety of colours and are sold separately. The HTC Butterfly 2 will be available through Chunghwa Telecom, Taiwan from 2 September 2014. No pricing nor package plans have been revealed yet. In other markets, CSL will be the exclusive carrier in Hong Kong. Launch and availability for Malaysia, Singapore, India and Thailand have not been announced.